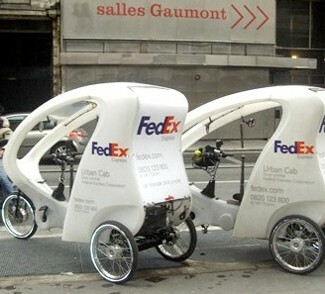 FedEx Corp. expands the use of innovative cargo bikes for its deliveries across the city of Paris. Paris plans to develop over 400 miles of bike lanes by 2014. Within the next 10 years, most of the city’s major streets will have dedicated bike lanes and the network will begin to be extended into nearby suburbs. In anticipation of this, a FedEx agency based in Paris launched a “tricycle project” in 2009 involving making deliveries on an electrically-assisted cargo bike. This was developed by the partner company Urban Cab, which already runs a passenger transport service with 22 pedal-powered rickshaws around the city. During a trial period, the tricycle delivered more than 2400 envelopes and small packages making 15 stops an hour on average. The tricycle is now fully electric-powered although the motor has to be started manually. The vehicle can travel at a speed of around 20 Km per hour and the storage capacity for parcels is quite large. The storage box can be lifted off manually by the driver or by the use of a pallet truck. It can access pedestrian-only areas thus avoiding the busy traffic in and around Paris’ city centre. As a result, deliveries are fast and efficient and the productivity per parcel is 20 to 50% higher compared to classic vehicles. There are plans to expand the fleet to 12 tricycles soon. Talks on introducing the tricycle in other major European cities (Bruxelles, Amsterdam, Munich and Milan) as well as other French ones are under way.